early in the morning, usually about 5am, the phone rings. A couple different days a week. It is the post office calling to alert us that boxes of chicks are on the way. The little chicks need to stay in the brooder for a couple of weeks. Then they move outside, still covered and still with a heat light on to protect them from rain and drafts, and to keep them warm. 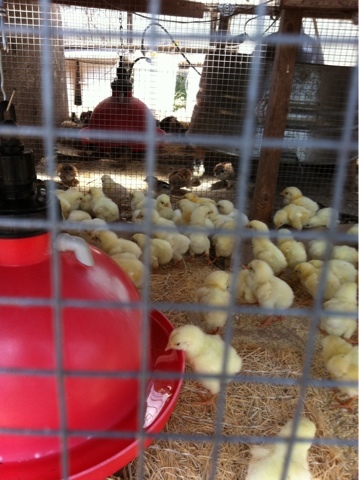 We have 100 chicks that will grow up to lay eggs. Later this week our first turkey polts arrive, as we start growing out Thanksgiving turkeys. And then chickens for dinner. Busy days, as we are also building and planting out vegetable beds. Truth is the pigs are hard at work clearing the beds and walkways, we then form the bed and add thick layers of compost to plant in..yay for pigs!